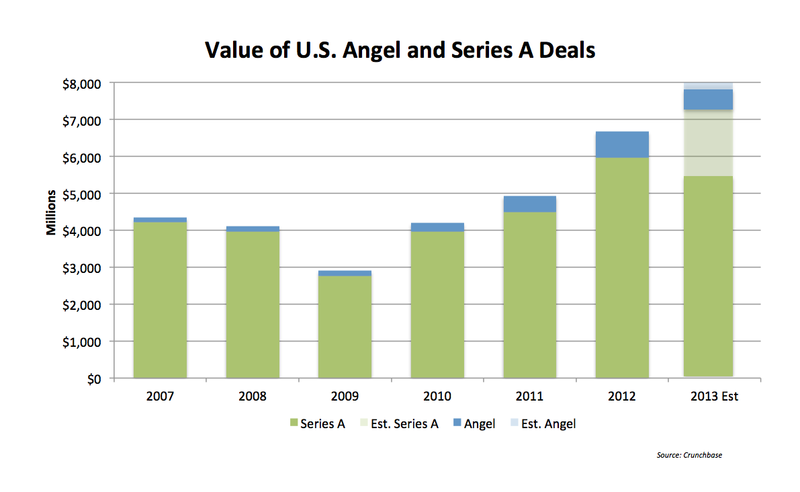 Angel investing in the US this year looks like it’s falling back towards 2011 levels, after a record 2012. Meanwhile, there are more Series A rounds than ever, based on our latest CrunchBase data. The much-feared “Series A Crunch” has yet to materialize. Early-stage founders and investors have been mulling the possibility of a flood of new angel investor money overwhelming the venture industry’s ability to fund all worthy young startups. But here’s what we’re seeing. In the first three quarters of 2013, the enormous annual growth of Angel investments has been falling, especially in relation to first venture rounds. 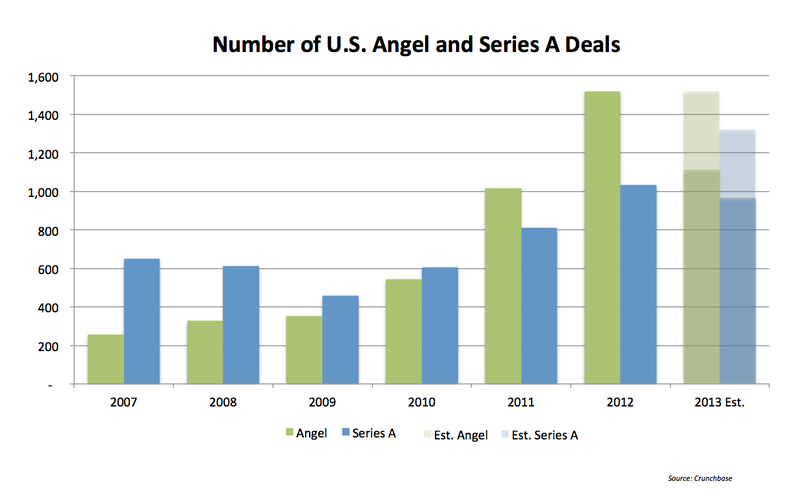 From the period of 2007-2012, the number of Angel investments grew by almost 6x, while Series A rounds only grew by about 1.6x. However, according to our dataset the total number of 2013 Angel investments are unlikely to reach the 2012 peak of 1,520 deals, while 2013 Series A investments are already very close to eclipsing the 2012 total at over 960 and counting. In total dollar terms, the trend reversal is equally striking. In the first three quarters of 2013, Series A rounds have amassed $5.43B, nearly surpassing the 2012 total of $5.96B while year to date Angel investments of $545M are well under the $707M total of last year. At this point, we’ll pause to note the various caveats with early-stage funding data. Not all early-stage funding data shows up here immediately, because financing mechanisms like convertible notes let startups legally delay announcing the money until they raise a venture round. 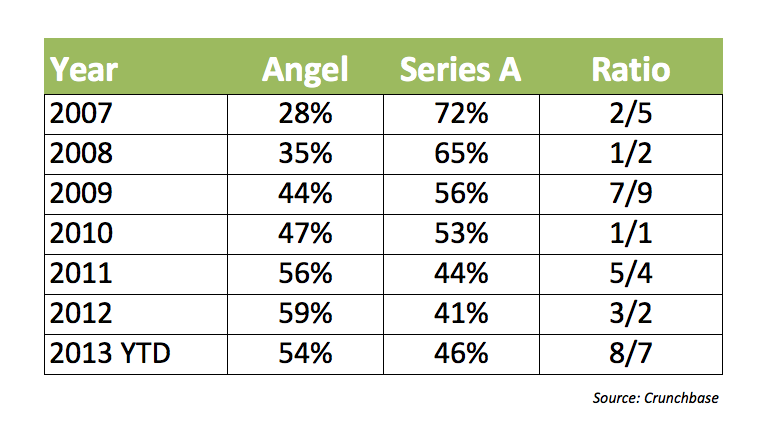 Some seed and angel rounds have also gotten quite large, in the millions range similar to a traditional first venture round. Large outlier rounds in any category can also make them skew large. This said, our data is based on a composite of data provided by companies and investors, cross-referenced with public filings and news reporting. We believe it’s the most accurate public data set out there. So what’s happening with angels? We can speculate that they’ve been scared off by a Series A Crunch concerns, or anything else. But instead how about you take a look for yourself using our latest data set — download the September 2013 Data Export and let us know what you find.